This recipe serves four, so you could eat half and save the rest for lunch the next day. Eggs provide a good supply of B vitamins, which help support a healthy nervous system. 1. Simmer the potato slices very gently in boiling water for about 8 minutes until just cooked through, being Be careful not to overcook them. Drain well. 2. Heat 2 tbsp of the oil in a medium frying pan. Add the onion and cook over a low heat for about 5 minutes. Add the red pepper and cook for another 5 minutes until softened. 3. Break the eggs into a bowl and beat with a whisk or fork then season with salt and pepper. Stir in the chives and the peas. 5. Add the rest of the oil to the frying pan and add the potatoes. Pour over the egg mixture and cook gently for about 15 mins until almost set and golden brown underneath. 6. Put the frying pan under the grill and cook for a further minute or two. 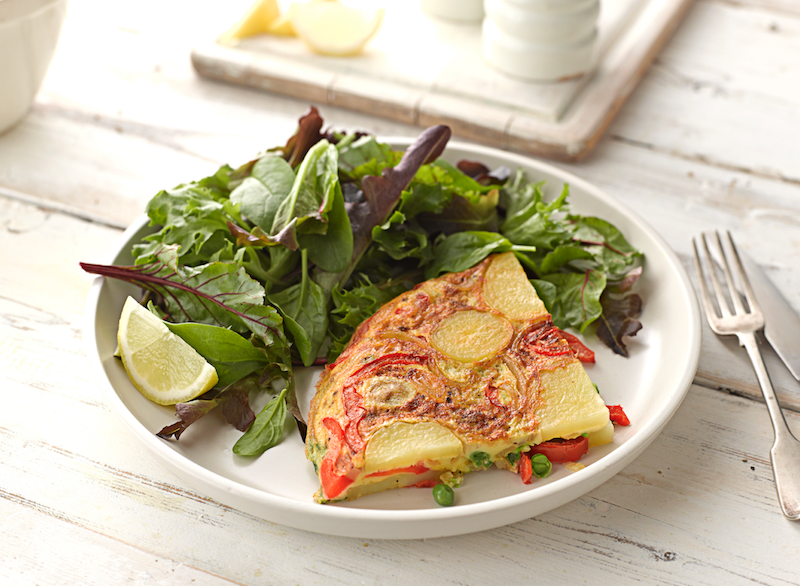 Turn the omelette on to a plate, cut into quarters and serve one quarter per person with salad leaves dressed in lemon juice.